Taxon 13: 210 1964. (sessiflora). Habitat and ecology: this species grows in the Pampa grasslands together with Gymnocalycium parvulum, Gymnocalycium gibbosum, Gymnocalycium bicolor, Lobivia aurea, Frailea astrerioides, Trichocereus candicans, Cylindropuntia tunicata, Cereus aethiops, Parodia submammulosa, Opuntia pampeana, Opuntia sulphurea, Notocactus submammulosus and the epiphyte or lithophyte bromeliad Tillandsia gilliessi, Tillandsia bryoides and Tillandsia myosura. 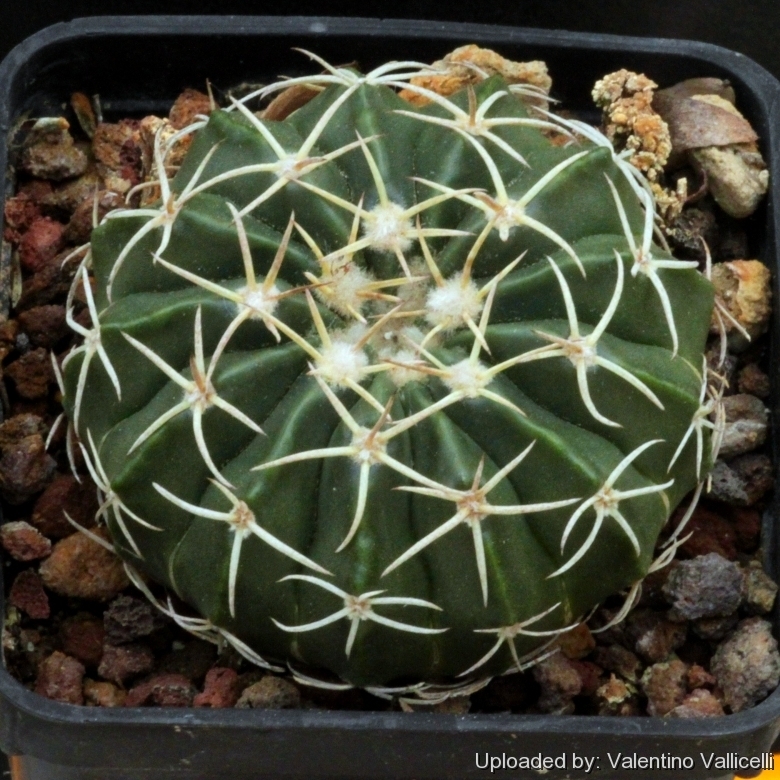 Description: Wigginsia sessiflora (a.k.a., Notocactus sessiliflorus, or Malacocarpus sessiliflorus) is a local or morphological form of the widespread and variable Parodia sellowii. It has spherical flattened stems, up to 20 cm in diameter with small yellow flowers about 25 mm wide, at the stem apex. However the distinguishing characteristics of Wigginsia sessiflora, appear to fall within the natural variation of Parodia sellowii and it should be synonymized with the latter. One of the typical features of (Wigginsia sessiflora), is the flower which is significantly smaller than most other Wigginsia, except only the closely related and very similar Wigginsia vorwerkiana. Stem: Spherical flattened, up to 200 mm wide, dark green, grey-green or brown-green. Ribs: Initially few, later up to 30, sharp, swollen around areoles. Radial spines: Initially only 2-4, later 4-5, to 20 mm long, 3 curved downard. Central spines: Nome, rarely 1. All spines dull white to horn coloured. Flowers: Small about 25 mm wide, yellow; Petals lanceolate, tip somewhat rounded. The species is self-fertile. Seeds: dark brown to black, 1.2 mm long and 1.1 mm wide. Varieties: A few varieties namely var. debilacantha, var. martinii, var. paucicostata, var. stegmannii where previously assigned to Wigginsia sessiliflora. The last three varieties were sometimes considered separate species. Parodia sellowii (Link & Otto) D.R.Hunt: has flattened stems, about 15 cm Ø producing several yellow flowers together around the woolly stem apex. It is extremely variable. Distribution: Brazil, Uruguay, Colombia and North Argentina. Wigginsia corynodes (Otto ex Pfeiff.) D.M.Porter: has dark olive-green body, with thirteen to sixteen, deep ribs and clusters of seven to twelve dark-zoned, yellow spines. Distribution: Southern Brazil, Uruguay and Argentina. Wigginsia fricii (Arechav.) D.M.Porter: has 6-7 radial spines, yellowish or whitish, unequal, curved, pliable, not piercing. Flowers ca. 3 cm long. Distribution: Coast of Uruguay. Wigginsia leucocarpa (Arechav.) D.M.Porter: has light-colored fruits white or pale pink (never purple). Distribution: Uruguay. Wigginsia macracantha (Arechav.) D.M.Porter: has somewhat stouter spines and larger flowers. Distribution: Uruguay. Wigginsia vorwerkiana (Werderm. ex Backeb.) D.M.Porter: Distribution: Colombia. Cultivation and Propagation: Wigginsia sessiflora is an easy to grow tropical cactus that like a warm bright location, but more cold tolerant than most. It requires a slightly acidic, permeable and nutritious substrate, regular watering and bright location. Soils: It prefer a very porous neutral to slightly acidic compost with plenty of extra grit. Watering: Water regularly in summer, but do not overwater, keep dry in winter. It rot easily if the substrate is wet and cold, tends to lose its roots in winter. Best if watered with rain water. Fertilization: Feed it once during the growing season with a fertilizer specifically formulated for cactus and succulents (poor in nitrogen), including all micro nutrients and trace elements diluted to ½ the strength recommended on the label. It thrives in poor soils and need a limited supplies of fertilizer to avoid the plants developing excess vegetation, which is easily attacked by fungal diseases. Hardiness: Reputedly sensitive to frost , but less so if kept on the dry side prior to, and during, cold weather (hardy to -5° C for short periods). However warmth throughout the year will increase the grower's success (8-12°C during rest season). Exposition: Outside bright filtered sunlight or afternoon shade, avoid full sun. Inside it needs bright light, and some direct sun. Subject to sunburn if exposed to direct sun for too long. Tends to bronze in strong light, which encourages flowering and heavy wool and spine production. Propagation: Direct sow after last frost. Seeds germinate in 7-14 days at 21-27° C in spring, remove the glass cover gradually as the plants develops and keep ventilated, no full sun for young plants!